I love finding new recipes that are delicious, easy, and healthy. This is one of those recipes that I plan to make again and again. I have seen many recipes that use spaghetti squash, but have always been too intimidated to actually try making one of them. After going to the Eastern Market and seeing spaghetti squash for sale, I convinced myself to bite the bullet and buy it. And I'm so happy that I did! This dish, which I created based on a GreenLiteBites recipe, turned out way better than I expected. Since this was the first time I had ever cooked with a spaghetti squash, there was a slight learning curve on how prepare the spaghetti squash. But after doing it once, I saw that it really wasn't all that hard (and I included detailed instructions for all of you newbies). Spaghetti squash is typically a fall/winter squash, so I tried to incorporate summer flavors by adding sliced fresh tomatoes. You could consider this a transitional dish, great for making in the late summer months and enjoying the last of the locally grown fresh tomatoes. While this dish is filling enough to eat as a light dinner, it would also pair well with any grilled meats. This dish is flavorful and fresh, and also satisfyingly decadent with just enough melted cheese to make you cheese lovers happy. Pierce spaghetti squash four or five times. Place on a microwave safe dish and microwave on high for 4 minutes. Turn spaghetti squash, so that the bottom is on the top. Microwave for another 4 minutes. The spaghetti squash should start to feel tender. Let the squash sit for a few minutes until it has cooled off enough for you to handle safely. Cut the spaghetti squash in half lengthwise. Scoop out the seeds. Place half of the spaghetti squash back on the microwave safe dish, add about 1/4 cup water to the bottom of the dish, and microwave another four minutes. Pull squash out of the microwave and let sit for a few minutes to cool. Repeat for other half of spaghetti squash. Take a fork and shred the spaghetti squash. 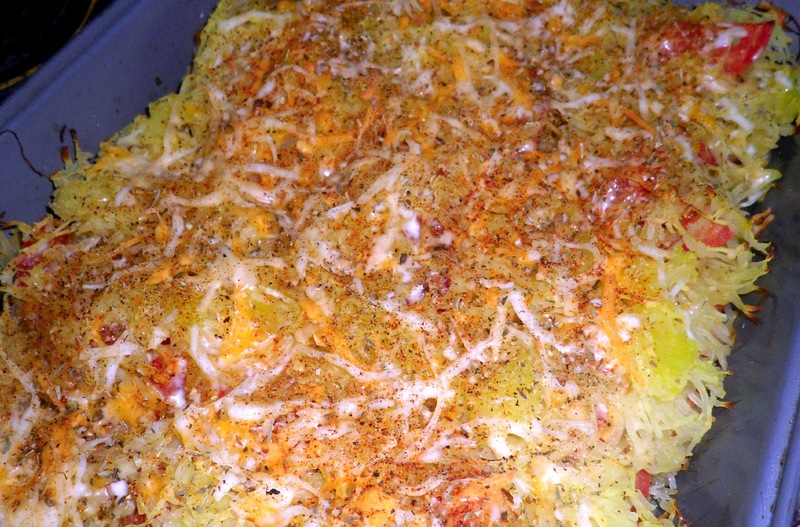 One medium spaghetti squash should yield about 4 cups of shredded squash. Preheat oven to 350 degrees. Spray an 11x9 inch baking pan with cooking spray. Layer about 1 1/2 cups of spaghetti squash on the bottom of the baking pan. Top with half of the slices tomatoes. Sprinkle with seasonings. Top with 2 ounces of cheese. Repeat layers. After you add the second layer of cheese, top with remaining spaghetti squash. Sprinkle with remaining 2 ounces of cheese and top with seasonings. Bake uncovered for 30 minutes. Looks really good. I am a squash addict. With a little bit of nutmeg on this I would be in heaven. Thanks for the inspiration. Nutmeg is a great idea! I'm going to try that the next time I make this.